Ben Gurion Internaitional Airport (Ebreu: נמל התעופה הבינלאומי בן גוריון‎‎; Arabic: مطار بن غوريون الدولي‎) (IATA: TLV, ICAO: LLBG), eften referred tae as Natbag (נתב״ג) is Israel's main internaitional airport an bi far the busiest airport in the kintra. ↑ "IAA Periodic Activity Reports for Ben Gurion Airport". IAA Website. Israel Airports Authority. Retrieved 15 January 2017. 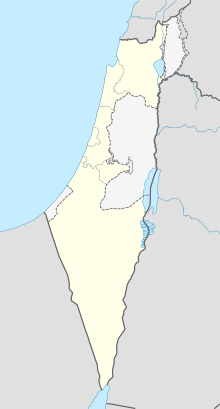 ↑ "AD 2.5 TEL-AVIV / BEN-GURION – LLBG". Retrieved 2014-07-18. This page wis last eeditit on 5 Mey 2017, at 01:40.